Sketchie agrees, after a fun (but tiring) visit with his two furry cat friends. Luckily, grandpa put up with his antics yet again. I won’t go into the multiple accidents he had, but I’ll just tell you that I have an amazing, patient, and kind father-in-law. He deserves many of his favourite baked goods when we visit over Thanksgiving in a couple weeks. And possibly a 6-week spa getaway. After a few rants and raves once home, Sketchie finally settled into his old digs, but unfortunately didn’t get the memo that we’re still on Pacific time. I have no idea how much coffee I consumed this weekend, but let’s just say my old friend, Bodum, is back to stay! Back in Ontario, it’s clear that summer has come to an end. Trees are starting to change colour and my robe and slippers have appeared for the first time in months. I was so acclimatized to the amazing heat we had in B.C., I temporarily forgot all about this fall stuff. With bronzed skin for the first time all summer, I came home only to cover it up with sweaters and pants. The summer clothes are in a rejected, useless heap in front of the washing machine. Since the weather was fitting, I consoled myself with grocery shopping and a healthy dose of fall produce. It’s good to be back in the kitchen, if anything! This weekend was all about squash…and cookies…and coffee beans. Actually, cookies were the first thing I made, not that that should come as a surprise to anyone. You’d think I’d be aiming for healthier fare after vacation, but I had one thing on my mind: recreating the amazing cookie as big as my head. That recipe will be coming soon, but since it’s Monday and we’re probably trying to eat a bit healthier, I have a vegetable recipe for you today. Don’t worry though, I don’t do boring vegetables. This recipe is inspired by the roasted butternut squash recipe I made back in 2009. It’s incredibly simple to make using only about 15-20 minutes of prep while the oven does the rest. This time, I made an almond pecan parmesan “cheese” and added Lacinato kale for green power. The result is a comforting fall side dish that will warm you to the bone. This comforting and nutritious side dish will warm you to the bone! The Almond-Pecan Parmesan lends a crunchy contrast to the buttery and lightly sweet squash. Finely chopped kale provides a boost of green power. Trust me when I say that it's so good you'll want to enjoy this dish as a main course. Preheat oven to 400°F (200°C) and lightly grease a large casserole dish with oil. Peel the squash. Thinly slice off the bottom and top and then slice through the middle lengthwise to make two halves. Remove seeds with a spoon. Chop the two halves into 1-inch chunks and place into the casserole dish. Add the minced garlic, parsley, oil, and salt into casserole dish and toss until combined with the squash. Do not add the kale yet. Cover the casserole dish with tinfoil (with a few holes poked) and bake at 400°F (200°C) for about 45 minutes, until tender and lightly browned. Meanwhile, in a mini food processor, pulse the Almond-Pecan Parmesan ingredients together until coarsely chopped. After cooking, remove the squash from the oven and reduce the heat to 350°F (180°C). Remove the tinfoil. Stir in the chopped kale and sprinkle the Parmesan all over the squash. Bake for another 5 to 8 minutes, uncovered, until the nuts are lightly toasted. Watch closely so you don’t burn the nuts. Serve warm. Status: Warm with a happy belly. Is it wrong I focused on the “cookie as big as your head” part of the post? 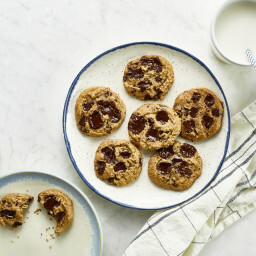 The actual recipe for this looks good of course but I’ll be waitin’ for that cookie! My baking gene has kicked in. The Mr’s co-workers are VERY happy! I made this for Thanksgiving dinner & it was a success! Hi Mari, That is great to hear, thanks for letting me know! The recipe looks great. I <3 anything with butternut squash. How do you think this will go without the cheese? Part laziness (lack of processor), part nut calories. but I love butternut and kale. It would still work fine without it, but probably won’t have the “wow” factor like I find it does with the nut cheese. hah I used to have fights over veggies at the dinner table many times. There is hope for everyone I guess! It’s starting to feel like fall here. 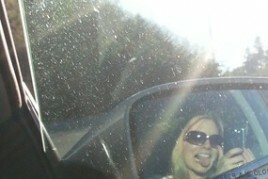 It was actually 50 this morning (cold for ATL). Love this recipe. I saw the pics and immediately want to make it with the thyme I just bought. Bring on the winter squashes! Can I just use almonds, I don’t have pecans…. I love the “one years ago” and “two years ago” additions!! I find so many great recipes on blogs that do that! By the way, this looks incredibly delicious! I can’t wait to make it! I got some delicata squash in my CSA share this week so I’ll have to use that instead. Thanks Jo! I’ve been trying to remember adding it in lately. I agree – I love when other sites do it too, especially if I’m new to the blog. I’m filing away for vegan Thanksgiving ideas!! :) Looks absolutely delicious. This looks incredible. 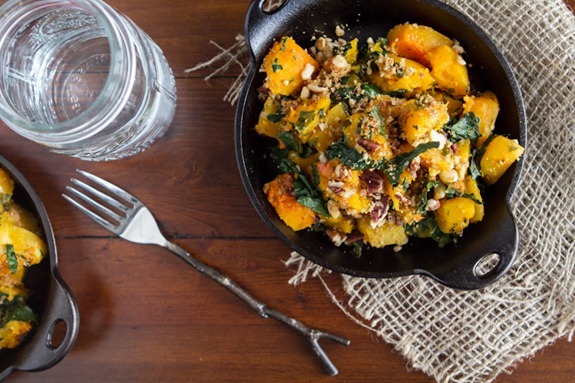 Nothing says Fall like a roasted butternut squash! I have 2 sitting in my kitchen just begging to be used….I just can’t decide what recipe I want to whip up first! Does the squash peel easily?? If you microwave one butternut squash for two minutes, peeling is a cinch! Looks delicious! I just ordered 3 different types of squash in my CSA this week and I have kale in the fridge so I will be trying this out for sure! I love the idea of nut parm. Can’t wait for it to drop below 90 here so I can use the oven again – almond + pecan + parmesan pretty much sounds like the best idea ever. Oh my gosh, this looks amazing!! I cannot wait to try that pecan “parmesan cheese” such a brilliant idea. I am fall crazy over here so anything with squash or pumpkin I am all about. Thanks for another lovely recipe! Welcome back Angie! So that looks absolutely scrumptious, but what caught my eye was that darling fork that looks like a branch! At first I thought you put a branch in the dish to give it an autumn look, but then I noticed that it was indeed a fork! Where ever did you find that? I have everything to make this. Thanks you just solved my question of “what is going to be the side”. 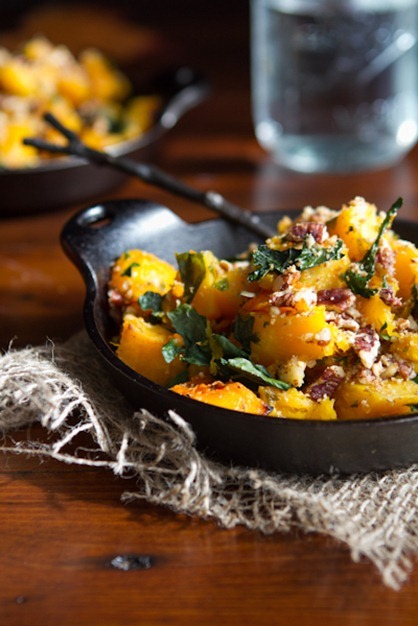 Looks super warming and comforting….love butternut squash! i’m not vegan, but that “cheese” sounds heavenly! My boyfriend and I also love to go up to Whistler and are obsessed with the Zephyr monster cookie and have been talking about recreating it and were just talking about doing it today… so I am so excited to see your recipe soon and I think he will too! Oh wow! That’s perfect fall comfort food! YUM! And this kale and squash looks delish. I love the cast iron or metal pot it’s in. So rustic and perfect for the dish! Beautiful pics! Looks absolutely delicious! I can imagine Sketchie causing all sorts of ruckus… reminds me of my kitty!! Sketchie is just too cute for words. And I also love the new one year, two years ago additions. I think I’ve seen almost all of your recipes before :), but it’s still fun because I’ve definitely missed some! I love fall for pumpkins only! “I don’t do boring vegetables” Oh you’re right about that! Love the look of your first homemade dinner. I always love getting back in the kitchen after a trip and whipping up something wholesome and warming. I’m still waiting for the Fall colours to come to Montreal. When I was in Calgary last week, they were in full affect… but we still have green EVERYTHING right now! Was just watching the new Sarahfit video and noticed that you were mentioned! I’m just I am not the first to let you know but I wanted to make sure you did. I am always happy to see you mentioned elsewhere on the net, because you are so wonderful! thanks for letting me know – I will check it out! Oh sweet culinary Lord, I must try that cheese recipe soon! Yummy! That looks perfect for today. This looks amazing! I’m thinking dinner later this week for sure! P.S. I absolutely love your food photography! I am obsessed with every ingredient in this recipe so I am very likely to become obsessed with it! OMG COOKIE! Ok will be waiting for that recipe, devoured a pack of vegan cookies in under two days lol. This recipe looks so tasty, have squash in the fridge and cant wait to try it. Is Sketchie a Bengal cat? He is so handsome! What did you serve as the main with this? Can’t wait to try this tomorrow – weather is wet and grey here! we actually ended up thawing some veggie burgers – I just crumbled one right in. It would go really well with my lentil walnut loaf too. This looks delicious! I’m putting it next on my to make list! As always, you have the most gorgeous vegan recipes, photographs and cat pics. Basically my favorite things! Thanks for being my go-to vegan recipe blog and for sharing your life and work with all of us lucky enough to be inspired by it all. And like you, Fall is such a magical of year for me because its Gourd Time, aka vegan pumpkin pie smoothie and muffin time! Thank you, I appreciate your kind words so much! They are so cool!! Totally great for fall & winter! A great recipe!!! 2 kids who said..we dont like butternut squash tried it and loved it including an italian exchange student i have here with us for a year. He was hesitant to even taste it..but he went back for seconds!!! I made a mac and cheese bites in muffin tins from tofu and the parmesan mix you have.. YUM!! Quick question: I wonder what you would serve this with (since you mention it’s a side dish)? Hey Emilie, we actually ended up thawing some veggie burgers – I just crumbled one right in. It would go really well with my lentil walnut loaf too! Perfect, I made 10 of your veggie burgers last week :) Thanks for the constant inspiration, I couldn’t have switched to a meat-free diet without your delicious recipes and optimism! is a genius idea to frost the sweet roast. 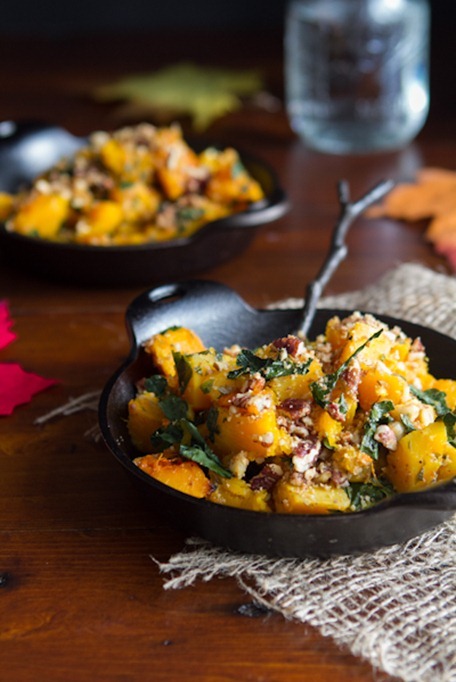 There is definitely something about roasted butter nut squash that makes you go…ahhhh! It will be risotto time again soon too! 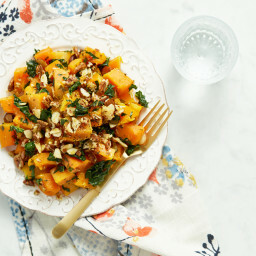 I just love Butternut Squash and your dish looks amazing!! 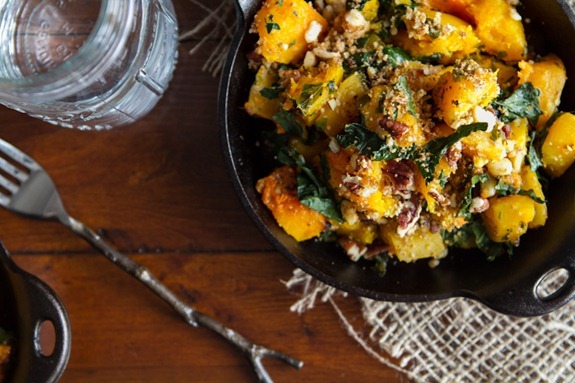 I eat squash like it’s my job during the fall/winters, so I’m so excited about this recipe. It looks amazing! I love your “Parmesan” cheese idea! I love this recipe, but wonder how it could be made with less oil (as in nuts). Do you think it would be just as good with less cheese, or could I somehow make the cheese a bit llighter? Any thoughts? 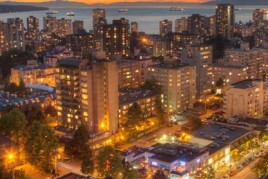 I really like this site and recommend it to many of my friends. If it’s helpful at all, you really don’t get many nuts per serving – say if it serves 4, you’d only get 2 tbsp of nuts max. Either way, if you want to lighten it up you could try grinding rolled oats to sub for half the nuts? Im sure sure how it would taste, but might be worth a shot. Thanks, a great idea. i am going to try this tomorrow night. So you would basically chop up the oats in a food processor and add that in? Great idea.Would other nuts, like walnuts work? I am restricted to 30 – 50 grams of good oils a day and very very low sat fats. I just made this for lunch and it was OUTSTANDING! All of the flavors work beautifully together! Thanks again for another great recipe! A perfect fall meal. Yum. MMM. Two of my favorite foods – butternut squash and kale. I just made a butternut squash and kale soup with veggie broth, shitake mushrooms, miso, garlic and ginger. Yummy. Angela, I don’t really comment on many blogs as I just help my wife with hers. However, I have to say over the last month or so… your photography has gotten really awesome! I am liking the dark backgrounds a lot. Seems to bring the food out more. Thank you Dan, that makes my week! I’ve been trying to branch out and try new things lately. I tend to only see parts I don’t like in my photos, so your praise is greatly appreciated! Hello! I made this last night and impressed the heck out of my boyfriend, who is the normal chef in the house :) Thank you so much for such an awesome recipe!!!! Okay, I’m kind of in love with how you presented this dish. It looks sooooooo delish, and I can’t get over how your served it in the cast iron! Fabulous! Ahh we had our first rain fall of the season and i’m so excited to make this dish! :) Love butternut squash! I am so happy that it is squash season. I love all fall foods. This looks perfect for the fall weather : ) I have been meaning to make your parmesan cheese version for a while, this was just the reminder and inspiration I needed to make it happen! This is amazing! Just made some with delicata squash (no need to remove the outer shell) and it was probably the tastiest thing I have had in months. Went with extra garlic and rosemary instead of parsley. Props! Glad to hear that Sam! I made this as you suggested, with half nuts and half ground oatmeal. it was fabulous. I am sure it would be even more fabulous with all nuts, but I keep my oils to a minimum. Thanks for this incredible recipe. i will make this many more times. Yay Im so glad it worked with oats! :) Thanks for letting me know. Hi Angela! I totally made this yesterday with a couple of cute little butternut squashes from my mom’s garden that were just aching to be made into a delicious dish–and the stars aligned and you published this post and the squash was delicious and everything is right in the universe. Thank you so very much. I feel like you are my flavor-soulmate! hah well Im honoured! ;) Glad you enjoyed it! We tried this recipe of yours and it was so good! Even our sons who don’t care for butternut squash liked it. Thank you so much! This was amazing. I will definitely be making this again. Thank you! YUM! I just made this… love the “cheez” alternative. 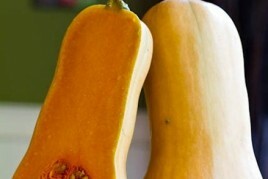 A great recipe for butternut squash! 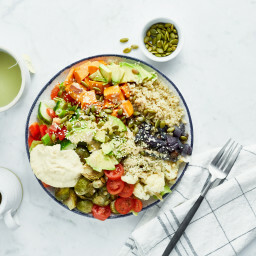 Everything in it is healthy and delish! I had my non vegan friends over for dinner last week and made them some of your delicious fall recipes. They were all amazed by the rich flavors and healthiness of all the dishes! I started them off with my go-to appetizer, Spinach and Artichoke dip (so creamy, they couldn’t believe it was bean puree) and the Mushroom Walnut Tart (first time, my new fave app that I want to make for Xmas). For dinner we had the Butternut Squash Mac N Cheese (so delish, I finally just finished the leftovers today) and the Butternut Squash with Almond and Pecan Parmesan (also a fave that’s surprisingly easy to make) because you can’t taste the butternut squash flavor in the Mac N Cheese recipe. Thank you for providing us with tasty & nutritious vegan recipes!! Wow you are superwoman! So happy to hear how well the dishes went for your party and that they were enjoyed. :) Now it’s time for you to kick back & relax, I’d say! This recipe rocked mine and my husband’s world last night! Thank you for the scrumptious recipes!!! You GENIUS, you!. =) Sooooooo perfect & hits all the right flavor & texture notes! The only thing I changed was that I didn’t have pecans that weren’t candied so I threw in just a few of those for a pecan taste & made up the difference with walnuts (to counter the sweetness of the sugar). Thank you for sharing with the world! Dumb question here…is the nutritional yeast optional? I’m making this to bring to Thanksgiving tomorrow and don’t have it on hand…should I made the extra trip to get it? Thanks! There is only 1 tbsp of nooch so I want to say skip it, however I find it really does add a nice Parmesan-y flavour. Either way Im sure it will still be good! I did decide to buy it…I was intrigued. Dish is in the oven now and I’ll let you know how it goes…smells great. Looking forward to finding other uses for the yeast…! Thanks. (we’re not vegan but I’m enjoying the vegetables and other recipes! Had this for dinner tonight, it was delish! Thanks for sharing! Tried this yesterday and it was excellent. I didn’t have kale so I used red chard and the colour of that added much to the dish. Will make again. Just made this one and paired it with your ceasar dressing on a big green salad and quinoa. Perfect fall dinner! Currently snacking on cold leftovers as I type, yum! I made this tonight. Though I omitted the nutirtional yeast and parsley, I added rosemary and parmesean cheese. I thought this dish was FANTASTIC! Ate it as my main course for dinner and didn’t even need anything else with it. I really LOVED it! Thanks for sharing! Thanks for the delicious idea! My husband and I LOVED it! Hi Angela! I’ve been using your blog as my go-to recipes ever since I had to cut out dairy from my diet a few months ago. This recipe was DELICIOUS! The flavors were great and really completed the butternut squash. My boyfriend couldn’t stop eating it hehe. Definitely going to become a staple in my cooking. Thank you! This was soooo delicious :) I really recommend you don’t skip the nut mixture! I have made this recipe several times this month! It’s a great easy dish for our “meatless Mondays” which my husband usually dreads. We serve this up as a main course and I actually add extra kale. It is perfect for an easy dish on a cold night! I made this this weekend. So good! I love all of your recipes. Have not made one yet that I dont like. Getting to the point we just browse your recipes and keep those items on stock. Where did you get those cute black cast iron bowls you serve these up in. They are cute! OK I thought the butternut squash and black bean burritos were my favorite squash recipe until I met this one! You’re right, the nut cheese definitely adds the “WOW” factor. I left out the parsley (not a fan) and added more kale, and also put it on broil for the last 5 minutes to crisp it up a bit. I could not stop eating it!! I will definitely be making this for Thanksgiving and I’m sure it will be a crowd-pleaser…thank you! This recipe is amazing! I have made it several times and recommended it to a bunch of friends. I increased both the garlic and kale (personal preference)… my husband is amazed at how much the almond-pecan topping actually tastes like cheese. Home run! Mmmmmm! So good. I used walnuts and chard because it’s what I had, and I kept everything else the same. Delicious. I so love your recipes! Seems a great recipe to try! Do you have any recommendations for what to eat with it? 1st time having Kale and the Almond Pecan Parmesan “Cheese” and it was delicious! I just hosted my first vegan thanksgiving for my family and made this!!! I didn’t change a thing and it turned out sooooo good. We absolutely loved the vegan parmesan toping! We ate the left overs straight from the fridge the next morning — even cold it was amazing!! Thanks!!! Hey Lana, I’m so happy to hear this! Thanks for trying it out :) Happy belated Thanksgiving! A little late to the party, but just whipped this up and it is delish! the nut cheese is so simple but really adds that extra flavor. i overcooked my squash a little (story of my life) but don’t mind it a little squishy :) thanks for the great recipe!! Where did you get that black cast iron dish? My favorite restaurant carries those and I’ve been searching for them! Hey Michelle, I think I bought them at Kitchen Stuff Plus store. They are SOLID/heavy and a bit expensive like most cast iron. I loved this recipe! It will definitely be going into my regular winter food rotation. After my first serving I ended up doubling the almond, pecan, “parm” and kale topping. It probably upped the calories a decent amount but it was so good and so easy to make I knew I needed more immediately. First time using nooch too and it was so perfect. Thank you! come to think of it, I didn’t weigh the squash, which was quite large, so maybe that’s why the topping initially seemed a bit sparse. I could have used to much squash. I love the 239 comments stating the obvious (OMG this looks SO GOOD I can’t wait to make it blah blah blah), but as someone who has actually made the recipe, my opinion matters at least 1,000,000x more. And with that introduction, let me say: it tastes even better than it looks. AMAZING! Thank you! Angela!!! This is the Best.Recipe.Ever!!! I can’t stop eating it!! Thank you so much!! I made this dish last night and absolutly loved it! Even my husband who swore he didn’t like butternut squash (all he had ever had was soup) loved it and said “you can make this anytime you want!”. I love the flavor that the kale adds, and I honestly do love recipes where the hardest part was trying to cut through the squash! I made this, but I processed the squash into thin slices, and processed the kale so it looked like parsley, then added a citrus fennel sage herbal blend instead of parsley. It was awesome! Oh my this recipe looks awesome. I love the mini cast iron pots & really like the twig forks! I’m gonna have to look for those when I’m ready to swap out mine. I just made this recipe (with sesame seed replacement due to nut allergy) and omg it is delicious! I also used Swiss chard instead of kale. I just discovered your blog today. Can you please tell me what would you pair this dish with? What about the sides? We had a guest this evening who is a Vegan. I searched the web and found this recipe. Wow!!! We were ALL amazed at how delicious it was…even our two year old ate it up! I am looking forward to trying other recipes on your site! Thanks!! Im so happy to hear that Jan! I didn’t have butternut squash and kale but I did have acorn squash and broccoli and this recipe worked great with those components as well! Even my 2 year old and meat-loving husband loved it! Thank you! Last month, I had a vegan friend over for dinner, and had stumbled upon this wonderful recipe! IT WAS DELICIOUS!!! I am making it again tonight and can’t wait! Thankfully we can get butternut squash in July!! LOL Thanks! I’m kind of new to butternut squash. I’m not sure how to peel it before it’s cooked. That seems really hard. Do you have any tips? Thanks! This is probably a weird comment, but I love your fork. Wherever did you get it? Hey Aimee, It’s from West Elm. Hope this helps! I made this last night and it was divine. I’m going to try very hard not to over make it, which is often what I do when I find a great recipe, and this website is FULL of recipes that I over-make because they’re all so great! 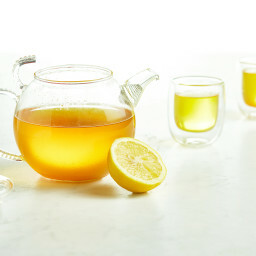 I just happened to stumble onto this recipe from a picture off to the side of your site that filters through with a series of others. To find it again without scanning the entire recipe index, I googled the key words that I remembered from reading the recipe. I was wondering where it lives on your website so that I can easily pull it up on my iPad since I don’t have a printer. Same question with your broccoli cheese soup. Angela, everything I’ve tried on your website is amazing. I really appreciate the effort you put into this. We all benefit greatly from your healthy, delicious foods, and incredible play by play photos. Beautiful! Thanks a million. Can you sub spinach for kale? What do you think? Think I could substitute baby spinach for that kale? I’m really not a kale fan. I’ve made this recipe twice, and my whole family loves it! The second time (today) is Thanksgiving, a time to indulge- so I drizzled some pure maple syrup over the top for an extra treat. Superb! I’m not a fan of pecans. Is it okay if I don’t use them? You can probably use whatever nuts you prefer :) enjoy! What is the purpose of nutritional yeast, never heard of it. Can I skip it? It provides a cheesy flavour :) Skip it if you like, but do try it sometime as it’s great in this recipe! I made this last night… Very easy and delicious! It was perfect. Thanks for posting this! I also used all pecans, but substituted almond oil for the olive. Worked great. I made this tonight. My roommate generally hates greens and was highly skeptical but ended up really loving it. That nut/cheese topping is amazing. I didn’t have any nutritional yeast so I used vegan parm. It’s definitely a keeper and so easy to make. OMG! Just made this last night and it is Amazing! It will become a regular at my house. My son stopped by and made himself a small bowl and liked it so much he took the serving spoon and started eating right out of the casserole dish! I doubled the garlic, cause we love garlic, but other than that didn’t change a thing. Delicious! Thanks so much for sharing. will it taste the same without the yeast? This recipe is amazingly delicious! Perfect winter dish with great texture, a little crunch, just enough sweetness….I had to stop myself from going back to have 3rds! Thank you so much! 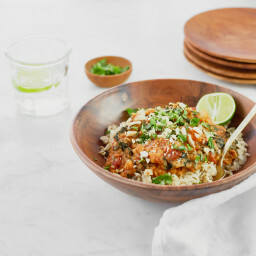 Love ts dish…it’s a favourite of both myself and my husband. Is there something I can substitute for the yeast? This sounds delish but I don’t want to have to make a trip to a special store. This looks delicious and your photos are lovely. Pinned it, made it, loved it! I took the suggestion of another reviewer and drizzled a little maple syrup on top. Yummy! I just made this dish probably for the 5th time. WE love it every single time. This time, I used really good quality olive oil in the ‘nut cheese’ and OMG! This has quickly become a family favourite. This recipe is amazing! I replaced the oil in the topping with a Tbs. of tahini. It’s going to be a new staple at our house! Thank you!! This dish was delicious ! Next time I’ll make a little bit more of the parmesan, it gives a really nice taste and adds a bit of crisp :):) Thank you for your delicious and healthy recipes !! Oh so good. I’m going to make this as a side for thanksgiving! I used crushed walnuts instead. I just threw them on top with some olive oil. Just as delicious. I don’t like squash as a rule, but I wanted to diversify my diet, so I decided to give it another go. This is awesome! I left out the nutritional yeast and I used blanched almond flour instead of grinding whole almonds. I’ll definitely be making this again! Thank you for sharing!! I’m allergic to sesame!! 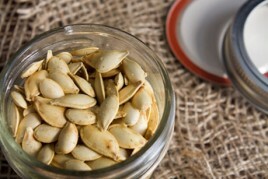 I am also not a big fan of pecans… Would pine nuts or another nut/seed work in place of the pecans or sesame? Hi Sarah, I would recommend almonds or cashews – hope this helps! Hemp seeds might be a good substitute. Lately I’ve been using a combo of roasted pepitas and hemp hearts…SO good! I subbed swiss chard for the kale and did not have almonds so just used pecans. So tasty. Angela Liddon – you never let me down! I just made this recipe out of your cookbook, but found it online so I can easily share with my friends. It was soooo delicious! Amazing how much the nutritional yeast and roasted nuts can add such a complex flavor. I never knew I could enjoy squash and kale so much. This looks delicious! Are there any substitutions for nutritional yeast? Or can it be left out? Thanks! Having loads of squash in the fall made this a frequent favorite recipe. But…..it’s worth going out and buying the squash in the store so that we can repeat all winter. Great Recipe! This was a nice dish! I served it on quinoa… yum. Thank you! This was an absolutely delicious recipe, thank you! It also makes a tasty complement to pasta with pesto. I’ll definitely make it again. Is it possible to eliminate the oil in this recipe? I know that sounds odd, but for dietary reasons, I need to eliminate oils. Just curious if you have any ideas/suggestions. Many thanks for the great recipes you share on the site! I have to say this is astoundingly good – like all your recipes! Made it tonight and was really impressed with it. Strangely, my husband said it reminded him of crab or sea food of some kind. I’m so happy it was a hit, Suzanne! Note that as of today, 8/19, there is a pop up ad for tyson chicken at the bottom of this page….. Which somehow seems really wrong here. Hi, Thanks for the heads-up! It’s challenging for us because we can’t see ads that display in other countries so I appreciate your comment. We block hundreds of advertisement categories (from meat to fast food to diet and weight loss ads…and SO many more! ), but occasionally our providers let them slide through due to poor categorization. Anyway, we will look into this and try to find the ad to remove it. Thanks so much! This looks incredibly delicious! One week ago my best friend came my house to met me. So that time I was very exited. Then instantly I remembered you and the recipe I cooked which I saved. Both me, my husband and my friend were felt very happy to eat and I promised her again I will make it. So thank you Angela for share such a beautiful recipe. Thank you so much. The day before: Bake the squash covered, as directed (I think it mentions up to 45 minutes, but you may want to bake it for a bit less time to account for the reheating time the next day). Then I would take it out of the oven and let it cool and then pop it (covered) in the fridge overnight. The next day I would let it sit on the counter for 15 minutes just so the dish isn’t super cold when going into the oven. Then I would toss it with the kale and bake it for 10 to 15 minutes. Then remove it from the oven, and sprinkle on the parmesan. Bake it uncovered as directed. I’m not positive that the squash would be heated through with these reheating bake times, but I would suggest checking a couple pieces to make sure they are heated through. Does this make any sense? I hope so! :) Let me know if you try anything out. Happy Thanksgiving! PS- I have a Thanksgiving panzanella recipe coming to the blog tomorrow, which coincidentally, is also make-ahead! Sounds like we’re on the same wavelength. This recipe is genius. The butternut squash on the counter had sadly expired, so we used a huge garnet yam. It worked perfectly. I followed your lead from Instagram and sautéed some kale on the side (with a few shiitakes). We served it with quinoa cooked with red pepper flakes. Dinner was heavenly. The pecan/almond “parmesan” was such a great addition. This is an awesome fall dinner!! Hey Christine, I’m so glad it was a hit! I’ll have to try it with yam…what a good idea. I am 5 years late to the party but I made this recipe last night and it is incredible! :D I have sent the link to everyone I know and I plan on making it over and over again :) I love how easy it was. I’m so glad I was able to find this again on pinterest! I lost my recipe from last year, and this was absolutely my favorite recipe for fall/winter. Absolutely delicious. Bonus that it’s vegan (I am not a vegan but I limit meat and animal products). If you haven’t tried this, you absolutely must. So happy it will be on our Thanksgiving table! Hey Tish, Thank you so much for the lovely feedback! I’m so happy to hear this. Have a lovely Thanksgiving! 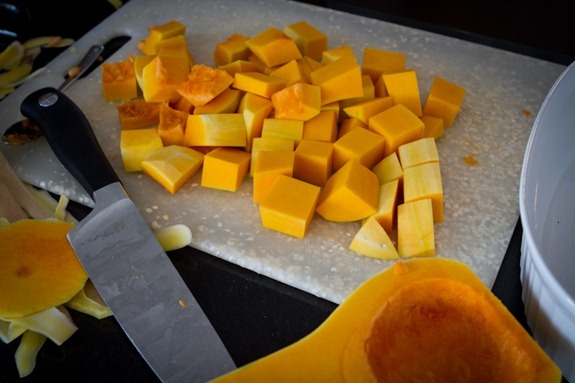 How would you use frozen precooked butternut squash? Do you just cook it like in the recipe? I’m afraid it will overcook but understand that it needs baking to blend the flavors. Also, your cookbook and blog is my fave! thanks! Frozen pre-cooked squash is a tricky one. I threw some into soup the other day and realized it turned to mush within minutes. I’m not sure if it would work for this casserole or not? If you try anything please let me know how it goes. I am so excited to try this, but I’m the only kale-ivore in my house. We have brussel sprouts still poking out of the snow and I’m planning to add some of those. Roasted brussels are a fave- especially with salt and oil. So, the question is at what point should I add the brussels? I’ve got it all prepped and ready to go for tonight’s meal- yum, I hope! Hey Alison, I love my brussels nice and crispy and browned so I would probably add them in with everything else, at the beginning. That said, the butternut may make them soggy. Another idea would be to pan-fry the brussels and simply stir them into the completed dish. Hey Shannon, I’m happy to help always! In the recipe ingredient list you’ll see “For the Almond-Pecan Parmesan” — this is the vegan parm recipe. You can double the amounts called for if desired. As written it makes about 1/2 cup. The title of this recipe is slightly different in the cookbook. It is Fall Harvest Butternut Squash with Almond-Pecan Parmesan on page 209. I have made this recipe at least 3 or 4 times. I like to serve it with a vegan loaf or I add it to baby greens with quinoa to make a hearty salad. It is so delicious either way!!! Thank you Angela for another great recipe. I just made this for the first time tonight. I used most of a bunch of kale – way more than 1 cup, and I put it in with the squash from the beginning because I wasn’t paying attention. Then since we aren’t vegan and I wanted it as a one bowl dinner I stirred in some roasted turkey breast before I added the nut topping. (I don’t love cheese and my husband doesn’t love nutritional yeast, so we compromised – I made it as written and told him to top his bowl with some fresh grated parm.) All told, it was AWESOME! I just licked the serving spoon clean :) We will definitely be making this again, maybe as a side at thanksgiving? ?